It’s hard to fault Fred Claus. The concept it so much fun by itself, that of Santa having a sarcastic, unsuccessful brother, that it immediately pulls you in. When it comes time for the actual plot to take hold, the film does falter, but still manages to be a colorful and entertaining holiday romp. One could see this film being Christmas Vacation, only with Santa’s family coming together around the holidays. In fact, that’s where the film succeeds wholeheartedly. 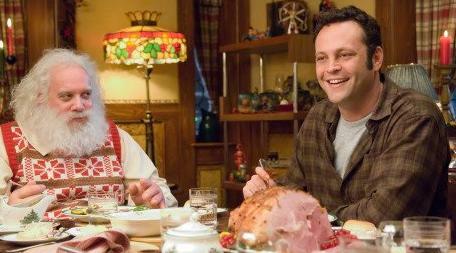 The interplay between Vince Vaughn as Fred and Paul Giamatti as Santa is wonderful. It makes you look at Santa in an entirely different light, and in a comedic manner worthy of the big screen. Vaughn plays a character he’s played before… or, plays nearly every time he stars in a movie. That’s fine, as his ramblings work even when up against a nine-year old girl. When on-screen with Giamatti he’s comedic gold. More importantly, the character is well developed to become an intriguing member of the Claus family. What doesn’t work is Kevin Spacey, or rather his place in the story. His performance is excellent, portraying a cold, nasty efficiency expert. His purpose, one of ensuring the North Pole can handle Christmas, becomes integral to the plot. It’s never particularly clear who runs “Christmas,” and his character is a baffling anomaly to give the movie some sort of purpose (not to mention deliver an action-oriented finale). The little things help Fred Claus rise above its obvious plotting problems. For one, the special effects are actually impressive. Many times, it’s hard to even tell there’s something amiss, especially with the elves (how they pulled off John Michael Higgins is a mystery in many scenes). Secondly, the string of cameos in the sibling support room is absolutely priceless, if not turning it into the best scene in the movie. While it’s doubtful this will go down as a holiday classic, there’s enough of that holiday warmth to go around to make this one special. You could dare anyone to watch one of the final scenes of kids excitedly opening their presents and not begin reminiscing about their own childhood. Cheap shot for emotional effect? Sure. Does it matter when the movie is over? Not when you walk away happy. Warner delivers a crisp VC-1 encoded disc for Fred Claus, and it’s a more than admirable presentation. The fine film grain gives the movie a nice texture, and the bright colors of the North Pole carry loads of pop. The transfer is sharp and excellently detailed. The fake snow looks fake thanks to the clarity of the transfer. Contrast is rather bland at times, settling into the mid-range, but it never looks overly soft or flat because of it. Warner continues a disappointing streak of not using any of the new audio codecs on their Blu-ray releases, slapping Fred Claus with a standard Dolby Digital 5.1 mix. It’s a rather flat mix, picking up a few times during sleigh rides. The separation isn’t as spectacular as it should be, and bass isn’t terribly strong. Crowded scenes in the elves workshop don’t offer anything in the way of ambience. The film should have a rather lively audio presentation, but it sadly fails to deliver. Almost everything in terms of extras aims towards the kids. A commentary from director David Dobkin is going to be as detailed as you get in terms of how the film was made. Pause for the Claus is a kid-oriented making of, interviewing “real” elfs on the North Pole who starred in the movie. Sibling Rivalry is about the core of the film, that of two brothers dealing with each other, and it includes interviews with many of the stars who made cameos during its 9:27 run time. Meet the Other Claus is a rather pointless featurette on Vaughn’s character. Fireside Chat has Vaughn and Giamatti interviewing each other about the film for a brief four minutes. A large stack of 13 deleted scenes run slightly over 25 minutes. With the film running close to two hours, these were wise deletions. Two other discs crowd the case. One is a digital copy, and the other is a DVD game exclusive to Blu-ray. Not only is the game incredibly un-fun, it’s on a standard DVD. Why not include it with the DVD version too?